Working in developing contexts had been a career goal for New Zealander midwife Jacqui Jones, so when a position came up with MSF she was quick to sign up. With MSF, Jacqui also found herself drawn to the opportunity to fulfil mentoring and teaching roles and empower local staff. Over the past three years, Jones has worked in Afghanistan, Nigeria, and most recently in Bangladesh where almost 700,000 Rohingya have sought refuge since August 2017. Jones was part of a team responsible for setting up a “Women’s Health Room” in a newly built clinic in the Tasnimarkhola settlement south of Cox’s Bazar. Established to provide antenatal and postnatal care, family planning, sexual violence and safe abortion care, the clinic’s generic offering made it easier for women to visit. Jacqui and Nigerian nurse Madeleine discuss the case of a premature newborn. The most difficult part of the process for Jones was stepping into the role of sexual violence advisor: “This assignment was personally challenging. “As a midwife, I’ve always been somewhat scared of the sexual violence space. In medicine, there are lots of things you can offer an opinion on, but not in this case. It’s personally challenging. The team offered psychological first aid, medication and vaccinations to women who had been sexually assaulted or abused. But, as Jones explains, “it emerged that what women needed most help with was contraception. “We saw women of all ages but many were 18-year-olds, usually because they had already had a baby within the two years beforehand, and didn’t want another baby just now. 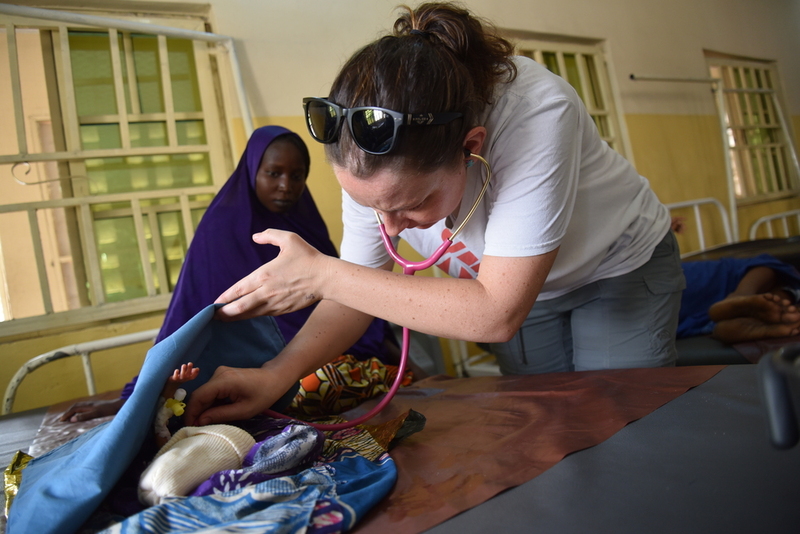 Jones understands that being a midwife with MSF isn’t always easy. “I’m not sure you can ever be prepared for it professionally. You will inevitably find yourself treating patients and conditions that you have only ever experienced in medical books." “The biggest challenge is not having many diagnostic tests. When I was in Nigeria, we were sending people to get ultrasounds, that were not always accurate. I had scans reporting ‘no cardiac activity’, and then a healthy baby was born hours later. Jones has also had many highlights, like the time she was in an MSF hospital in Borno State, Nigeria. Accepting that working in these contexts is different medicine to back home is part and parcel of the role, says Jones. Fanne, 17, rests with her premature baby on her stomach after Jacqui helped her to give birth. For others looking to work overseas, Jones says the best way forward is to set realistic expectations from the get-go. “I’m not sure you can ever be prepared for it professionally. You will inevitably find yourself treating patients and conditions that you have only ever experienced in medical books. “Personally, you need to be in a good head space, and accept that the work is tough and often with long hours. “However, it is very rewarding and your colleagues keep you grounded, offering support and a special bond you will never replicate in any other working environment."